With all the planned development in the Roxborough area, increased traffic and how it’s going to be managed is something for discussion. 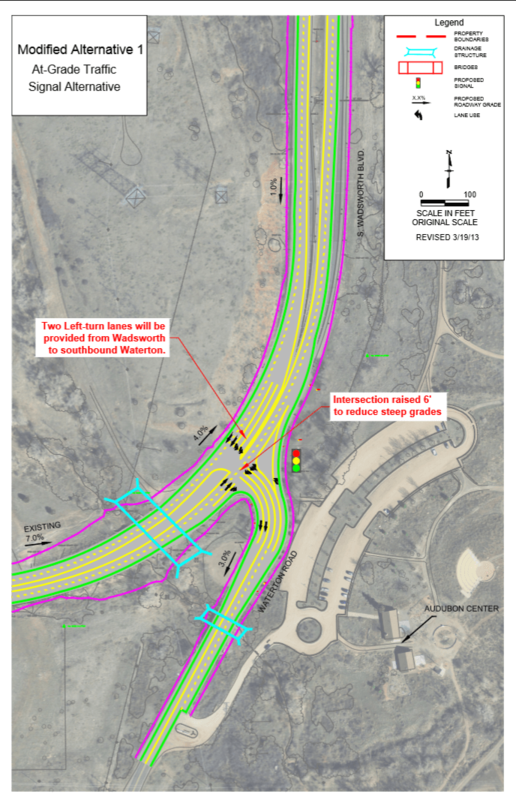 For example, Jefferson and Douglas county, along with Lockheed Martin, funded an initial engineering analysis and design work for an improved Wadsworth Blvd. and Watertown Rd. intersection. Original plans called for a bridge from Wadsworth onto Watertown with a pedestrian path beneath the bridge. However, after re-evaluating the projected traffic, the volume was much less than previously anticipated. Therefore, a traffic signal at the intersection may be a more viable option not to mention it would cost considerably less. The bridge was estimated to cost about $11.6 million where as the traffic signal is estimated to cost $4.1 million. Currently the project has construction planned for a start date sometime in Spring of 2016. Please click here for additional information.